The reign of tea-flavored cupcakes continues. 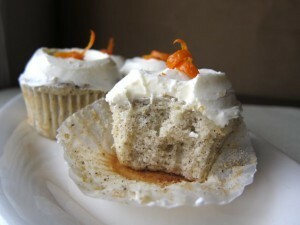 Yesterday I posted a recipe for green tea cupcakes. 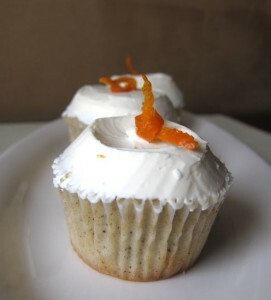 Today, I'm sharing with you a recipe for Earl Grey-flavored cupcakes with a citrus Swiss meringue buttercream. Earl Grey is a tea blend with a distinctive aroma and flavor due to the addition of oil from bergamot, a citrus fruit. I've always been curious as to what it might taste like in a cupcake, so here it is! 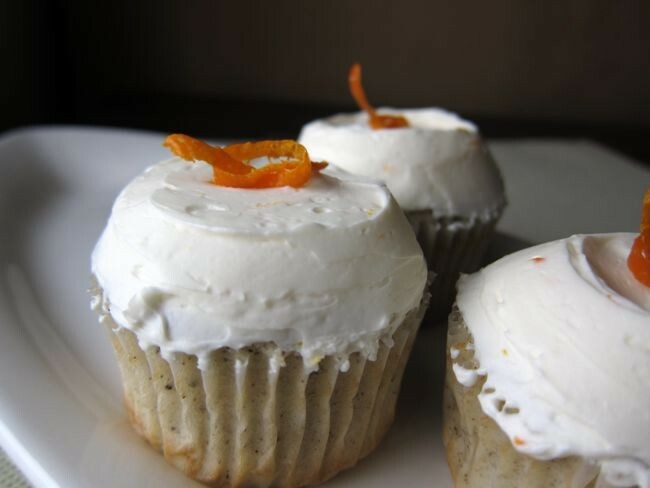 To compliment the bergamot flavor, I paired the tea cupcake with a citrus frosting. For the frosting, I went with a silky smooth Swiss meringue buttercream flavored with two types of citrus  lemon juice and orange zest. The resulting cupcakes were fragrant and floral. Preheat oven to 350 degrees. Line a 12-cup muffin tin with paper liners; set aside. Using a coffee bean grinder, grind contents of 3 tea bags to a coarse powder. Soak the remaining tea bag in the 1/2 cup of milk. In a small bowl, combine flours; set aside. In the bowl of an electric mixer fitted with the paddle attachment, cream butter until smooth and creamy. Gradually add sugar, beating until fluffy, about 3 minutes. Add eggs, one at a time, beating well after each addition. Add dry ingredients in 3 parts, alternating with the milk, and scraping down sides of bowl in between each addition; beat until ingredients are incorporated but do not overbeat. Add in ground tea. Divide batter evenly among liners, filling about three-quarters full. Bake until a cake tester inserted in the center comes out clean, 20 to 25 minutes. Transfer to a wire rack to cool in tins for 15 minutes. 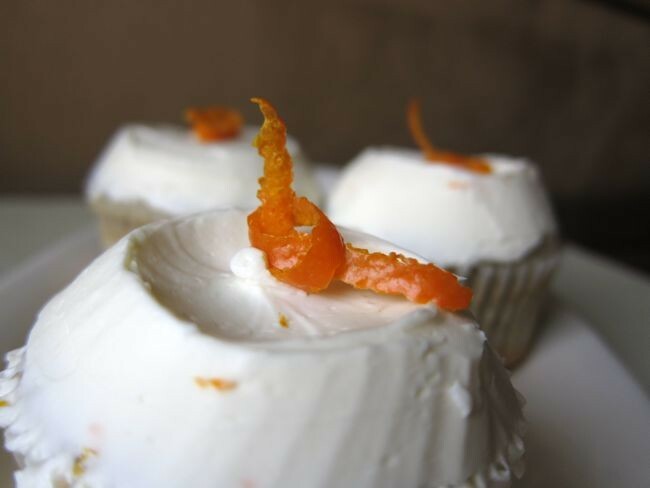 Remove cupcakes from tins, and cool completely on rack. Once cupcakes have cooled, frost with Swiss meringue buttercream. Put the sugar and egg whites in the medium heatproof bowl and fit the bowl over a plan of simmering water. Whisk the the mixture constantly over medium heat, until it feels hot to the touch, about 3 minutes. The sugar should be dissolved, and the mixture will look like shiny marshmallow cream. Remove the bowl from the heat. Working with the whisk attachment, beat the meringue on medium speed until it is cool, about 5 minutes. Switch to the paddle attachment and add the butter a half stick at a time, beating until smooth. Once all the butter is in, beat in the buttercream on medium-high speed until it is thick and very smooth, 6-10 minutes. During this time the buttercream may curdle or separate  just keep beating and it will come together again. On medium speed, gradually beat in the lemon juice, waiting until each addition is absorbed before adding more, and then the orange zest. You should have a shiny smooth, velvety, pristine white buttercream.